We walked about 15 minutes through the city to the Shinjuku Gyoen National Garden this morning. We went from being surrounded by tall building and busy streets filled with people walking to work to this sanctuary of beauty. Once inside, the only part of the city that could be seen was the clock tower. We walked the trails and took in one of the most beautiful places we have ever seen. I was truly overwhelmed by the beauty surrounding us and the bitty boy sleeping in my arms and felt the most incredible thankfulness for it all. God is so very good. All through out the park there were small children there as a class with their teachers. All of them were wearing hats all alike... like this little line of yellow hats. (: The children were all so very cute! We left the park and walked through the city. There are giant buildings, stores upon stores and busy streets... and then you can turn and find yourself in a small alleyway where cars don't drive and there are these hole in the wall restaurants and shops. We decided to be adventurous and eat at one of them. They didn't know a single word of English but we managed to get the best meal yet!! We left here and somehow navigated the subway system... I think we only took the wrong train once and felt lost only half of the time. (o: But we got to the Embassy and back! We have everything we need now in order to come home with Rhett!!! We have one more full day here... and will use it to meet his birth mother and grandmother. We are having a wonderful time while we are here and it is truly a gift to be able to spend this time to get to know Rhett and see his birth country, but man, oh man do I miss our chickens!! We have face-timed as much as we can and it kills me not to be able to hug and kiss them. Very soon we will all be a family... I am seriously worried that my heart just might bust when we are together. Today we met our guide at 8am ready for a jam packed day. We went first to get Rhett's medical exam. We got there before our appointment at 9 and waited a long time. We saw a doctor that spoke perfect English (which is always nice!) We were very pleased that we did not have to complete any vaccines for him here. They are okay with us doing all of that at home. Normally families can leave the medical visit with the forms they need for the Embassy but unfortunately, the report we needed to have from the doctor wasn't ready in time for us. That means that we have to return to the Embassy a second time tomorrow. We were able to get the interview done at the Embassy (where we raised our right hand and swore to always love and protect this bitty boy.) They gave us approval for our I-600 (which means that we will be able to legally adopted him once we are in the states). We will return tomorrow with his medical information and will receive his visa. This bitty boy is just incredible in every way. Incredible to hold, and stare at all day too. 💕💕💕 He has the sweetest disposition- he hardly makes a peep during the day. We had appointments the whole day, 9am until 4pm, and where we were completely exhausted, he carried on peaceful and perfect. Apparently, Halloween is big here too! The area right outside our hotel has these trees lit up and as we walked through the city we saw a lot of people in costumes, out having fun with friends. A lot of store fronts are decorated... and in a very fun and pleasant way, not a creepy way. This is what the baby formula looks like here. They are in large cubes that you place in the bottle and add hot water too. It has made it very easy to take with us and mess free... He takes 3 cubes to make 120ml or 4 ounces. I know I've posted our view from our room already, but I just can not get over it! See that area in the middle with all of the trees? It is a park that is only a few minutes to walk to... we plan to visit it tomorrow! This whole day hasn't felt real. At 11:40am Kenta came through our door with the nanny who has cared for him for the past 2 weeks (on the right) and our guide. We really can't even express in words how it feels to look at Kenta and know that he is ours... it is a miracle. The yellow blanket is from Kenta's birthmother. We will get to meet her on Thursday, it is so very wonderful that we will have this opportunity. We have only had Kenta for 5 hours now... he has been an absolutely angel. He is so quiet that we have checked many times to see that he is still breathing. We still have not picked a first name for him... I hope we will have some inspiration now that we know him. Pictures only show a glimpse of the complete Kenta. He is beyond my wildest dreams. And lastly, we went out with our sweet boy and found delicious noodles for lunch. First time eating noodles with chopsticks while holding a baby! Many more firsts to come. This is like a dream. Cody here as a guest poster on the blog. I'll let you all know when it's me posting from now on. Kristen says I always give too many details when I tell stories, so be prepared. As you all know we got into Tokyo yesterday afternoon after flying all day from Atlanta. The flights were great and luckily on the leg from LAX to Tokyo the plane was only about 2/3 full so we had 3 seats to ourselves. We were able to somewhat sleep, but were still exhausted when we go to the hotel around 4:30. After unpacking and laying down (it was really nice to be able to lay horizontally for a few minutes) we decided to go out and explore a bit. 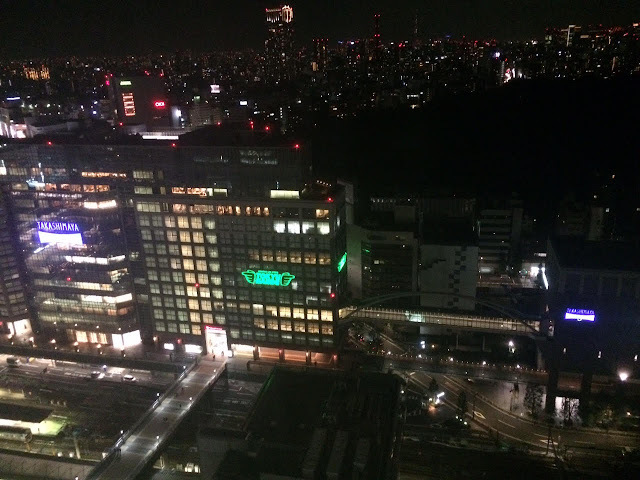 We are staying in part of town called Shinjuku, and are right across the street from Shinjuku Station which is the busiest railway station in the world! Before dinner we went looking for baby formula and "Baby water." Apparently it OK to drink the tap water here, but it has too many minerals for babies so they make a special bottled water for babies with a lot of the minerals taken out. We walked around for a while and checked out several 7-11's, and a couple Family Markets (which are just like 7-11). We didn't have any luck so Kristen asked the lady working at 7-11 and she pointed us to a place across the street. It was a 7 story store that looked like it just sold electronics. After exploring about 4 floors, we showed someone a picture of the formula we needed and he directed us to the basement...we had no idea there even was a basement. We found the water and formula but Kristen wanted something for her heartburn so we spoke to a guy and tried to explain what we needed. He found us some sort of medicine that had a picture of a happy stomach. So we gave it a shot. Once we got what we needed we decided to get some dinner. There are tons of restaurants around us from little hole in the wall noodle shops to McDonalds to pretty nice sit down places. We decided to go to a sit down restaurant for dinner and picked a place called Tavern S. It had a very American feel and smelled great, so we gave it a shot and were not disappointed. The food was fantastic and everyone there was very polite. Most people speak English but not incredibly well, so we usually end up playing a bit of charades. While at the restaurant our waitress seemed to speak pretty good English, so we showed her the medicine we just bought and asked if it was good for heartburn. Apparently "heartburn" is tough to translate. Luckily I had access to Wifi and Google Translated "heartburn" into Japanese and the waitress confirmed that our Happy Stomach medicine was indeed for heartburn. Crisis diverted. Like I said, the food was great. I had a cheeseburger and Kristen had Chicken Carbonara. Who would have known this would be our first meals in Japan?! After dinner we went back to our room and tried to stay awake as long as possible. It was only 7:30 but we were exhausted. After FaceTiming with the kids I passed out and woke up the next morning at 6:00 am. Perfect! When I opened the binds in the morning, we were astounded at how beautiful the city looked. 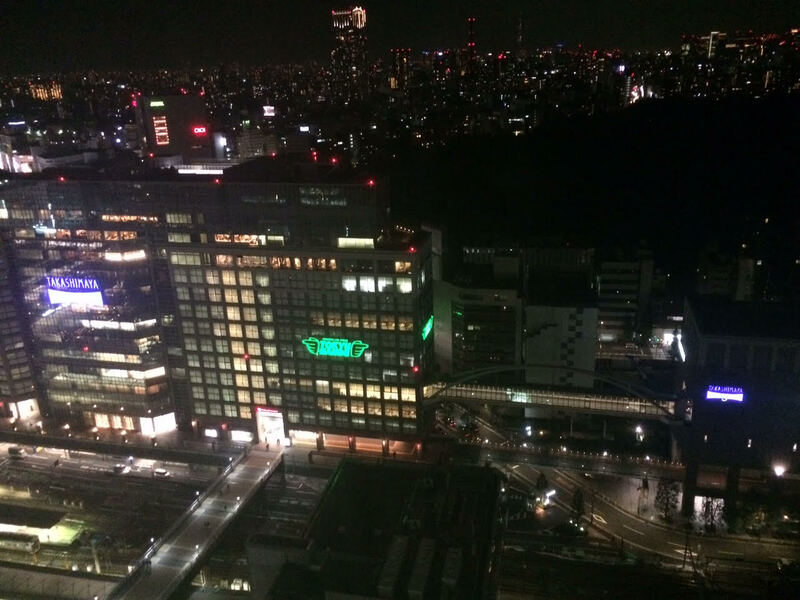 Our room overlooks Shinjuku Station and the Shinjuku Gyoen National Garden. The sunrise was amazing! For breakfast we ate at the hotel and they had a very nice buffet. I was a little worried at first because all I saw was fruit, salad and something called Horse Mackerel. Luckily I spotted some waffles, french toast and pancakes. On the other side they had sausage (which ended up just being small hot dogs), crispy bacon (real bacon!) and something called "bacon" which looked like bacon that was just warmed up and not crispy. I've been referring to it as "trichinosis bacon." Overall we really enjoyed it. After breakfast we decided to walk around outside for an hour or so to explore. This might not be very interesting to everyone else, but here are some of my observations. First of all this place is C-L-E-A-N! It's hard to explain but everything is just orderly and clean. We walked outside for about 30 minutes before we saw a piece of trash on the ground. All of the cars here are clean, especially the taxi cabs. The cabs all look like late 80's model Nissans but look like they just rolled off of the assembly line. The guys that drive them all wear suits, white driving gloves and the seats have white lace covering them. Secondly, this place is quiet. Again, this is hard to explain but people don't seem to talk much. It's Monday morning here so we were walking among everyone going to work. We walked for about 15 minutes before I realized that NO ONE was talking on their cell phone. Not a single person. I bet we walked by thousands of people and nobody had a phone out. After walking for an hour we saw TWO people walking and talking on their phone...they were both Americans. Third, there is music almost everywhere. When we walk through our hotel we hear this very soft, very sweet music. I need to see if I can record it because it's hard to describe. It's just very pleasant and very light. Even when we go outside there is a similar music playing in most places. We are loving this place! Well it's 11:15 and Kenta is supposed to be here in 15 minutes! Stay tuned. 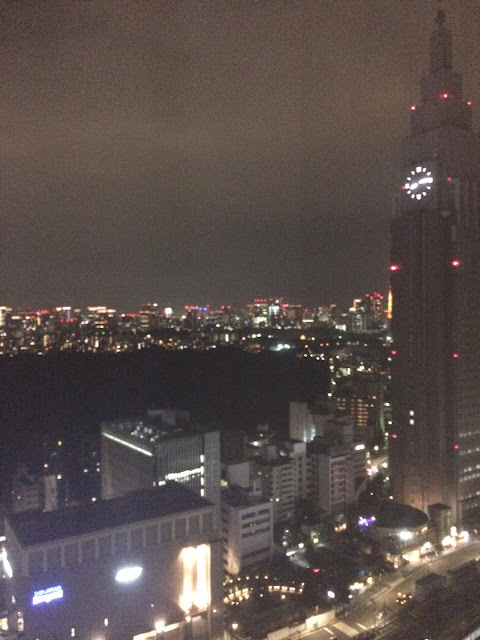 We Made It to Tokyo!! Our day began at 4:30am Saturday morning, we flew to LAX (5 hour flight, 2 hour lay over) and then we flew to Tokyo (12 hour flight). You know you are on a long flight when they pass out slippers and eye masks. We landed and found our hotel!! We are right in the heart of the big city. 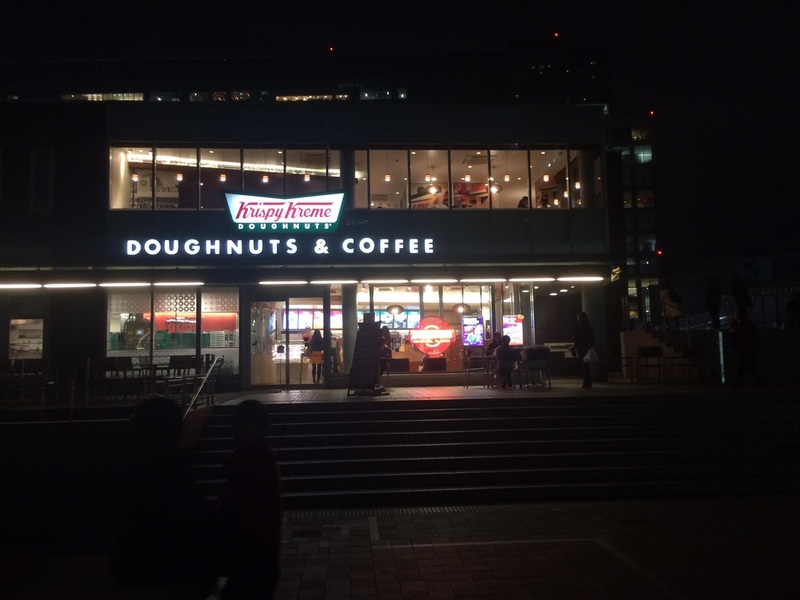 There is a Starbucks and Krispy Kreme directly next to our hotel... and within walking distance we have everything else! So far a couple of things that we've noticed about Japan : I will bet money there isn't a cleaner place. Everything is immaculate and orderly. Smoking on the sidewalk is a punishable offense. People are dressed up and very fashionable.... and it seems that there are couples holding hands and wearing a smiles at every turn. The view from our room is spectacular!